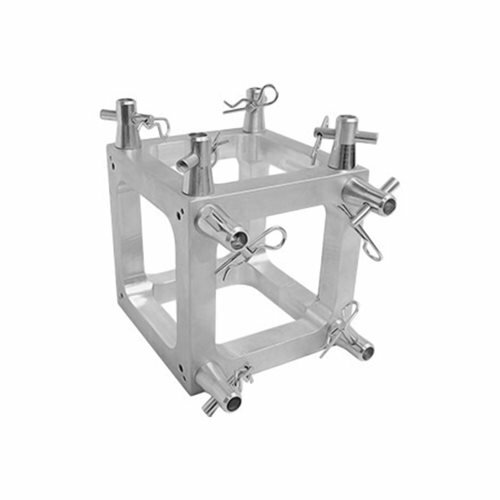 STUJBF14 Universal Junction Block Configuration From 2-Way Up to 6-Way. This 2- to 6-way universal corner which comes with two connecting sides. It has a 3-7/8 in. (100 mm) overall width, 3/4 in. outer diameter tubing, 1/4 in. diagonal bracing, and .08 in. wall thickness. It weights only two pounds. View More In Lighting Accessories. If you have any questions about this product by Global Truss, contact us by completing and submitting the form below. If you are looking for a specif part number, please include it with your message. © 2019 - inguardswetrust.com. All Rights Reserved.